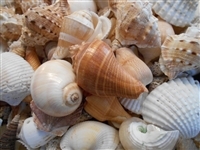 This authentic Beach Shell Mix looks like it was just collected from your favorite Beach. The shells are somewhat worn by the surf and may contain holes, just like the real thing. Great for Aquarium Bedding, Vase Filling and Crafts projects.